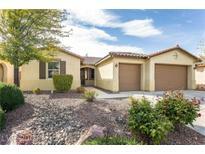 Below you can view all the homes for sale in the Mountain Falls subdivision located in Pahrump Nevada. Listings in Mountain Falls are updated daily from data we receive from the Las Vegas multiple listing service. To learn more about any of these homes or to receive custom notifications when a new property is listed for sale in Mountain Falls, give us a call at 702-323-5946. Well Maintained Home In Mountain Falls*large Corner Lot*mature Trees*covered Back Patio* MLS#2088201. Access Realty. Tandem garage floor, storage & workbench for hobbies. MLS#2089411. Coldwell Banker Premier. All of this in a beautiful golf course community, featuring a club house, exercise facility, pool and spa. MLS#2089331. Realty Executives In Action. Large covered patio w/ mature trees in back exterior fans. Master has backyard entry & more. MLS#2088127. Access Realty. Check out the Drone Footage in the 3-D Home tour...Look around, Ask Questions, Fall in love and make an offer. MLS#2087076. Lisa Bond Real Estate LLC. Home Is Located In The Cul De Sac. MLS#2085545. The Land Office II. New outdoor spa and outdoor furniture on full covered patio will convey with sale. Hole 10view MLS#2085025. Easy Street Realty Las Vegas. Mtn Falls community offers 18-hole golf, range, 3 pools, gym, spa, clubhouse & grill! MLS#2084070. Realty Executives In Action. Office/den ideally located and gorgeous low maintenance landscaping makes this home a Must SEE! MLS#2081321. Elite Realty. Mtn Falls has 18-hole golf, 3 pools, spa & gym! MLS#2081258. Realty Executives In Action. Great community with Golf, community pool, spa, exercise room, fitness center and social calendar…. MLS#2079967. NextHome Integrity. 3 Bedroom, 2 Bathroom, 2 Car Garage Home With Many Upgrades. A Real Must See!! ! MLS#2080068. Nevada Realty. Huge Master w/ B yard entry, 2 walk-ins, dual sinks and garden tub.Too much to list. MLS#2078229. Trish Rippie Realty Inc.
Community has 18-hole golf, 3 pools, spa, full gym + fitness studio, & restaurant! MLS#2077511. Realty Executives In Action. This home features upgraded Stainless Steel appliances, white cabinets, beautiful granite in the kitchen, stainless steel apron sink, upgraded flooring, garage walls and ceiling insulated, extra insulation on interior sound walls, upgraded entry door, jetted tub in master bath, soft water loop, pre-plumbed for sink in garage, full length covered back patio, and a fully landscaped yard. Come see! MLS#2076181. Way Out West Realty. Lowest Priced home in Mountain Falls! MLS#2073280. Las Vegas Real Estate Services. French Doors to Large Covered Patio with Mountain Views! MLS#2071514. RE/MAX Advantage. 3-car garage, 2,536 sqft home, 3bd + den. MLS#2071637. Realty Executives In Action. Solar screens, Vinyl lined pool and alarm. MLS#2070424. Nevada Realty. Mtn Falls Golf Community offers 3 pools, clubhouse, spa, gym, fitness studio, parks, community 18-hole golf w/driving range! MLS#2064804. Realty Executives In Action. The covered back patio is your calming paradise. + all HOA amenities. MLS#2065231. Keller Williams Market Place. No grass to cut.Golf course in community.Swimming pools,restaurant,clubhouse.Lots of areas to walk. MLS#2060301. Cryer Realty West. Too many beautiful items to mention, you must see to believe. MLS#2057152. First Choice Realty. 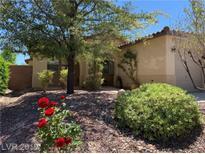 Beautifully Landscaped, Covered Rear Patio, Granite Counter Tops, Stainless Appliances, To Many Upgrades To List!!!! A Real Must See!!! ! MLS#2056771. Nevada Realty. Built-in bar, fireplace, & clubhouse offers pools & full gym! MLS#2047630. Realty Executives In Action.